Dr. Cara Augustenborg is an environmental scientist by training and a media pundit by passion. Image Magazine named her as one of 18 women to watch in 2018. She is currently a Senior Fellow in Environmental Policy at University College Dublin and serves as Chairperson of Friends of the Earth Europe. Cara was appointed by Minister Denis Naughten as an advisor to Ireland’s Environmental Protection Agency in 2016 and to the first National Dialogue on Climate Action in 2017. She also serves as an advisor to Cool Planet Experience's Climate Champion programme and was the first person in Ireland to join Al Gore's Climate Reality Programme in 2013. In 2016, the Sunday Independent named Cara as one of the 20 most influential people to lead the low carbon transition in Ireland and GreenNews.ie called her one of five women in Ireland making incalculable contributions to Irish environmental issues. 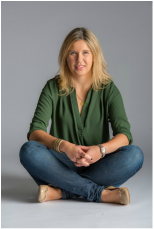 Her blog, ‘The Verdant Yank’ gives her take on "green" issues from an Irish-American perspective and was awarded Ireland’s best political and current affairs blog in 2016. Cara conducted her doctoral research at Ireland's Agriculture and Food Research Authority, Teagasc, and was the Irish Ambassador for Ben & Jerry's Climate Change College, traveling to the Arctic with the late Marc Cornelissen in 2008 to witness the impacts of climate change first-hand. Cara was educated in the United States but her mother is from Co. Kerry, Ireland. She is therefore a dual citizen of Ireland and the USA. Cara was born in Germany while her father was stationed there as a fighter pilot for the U.S. Air Force. Following their time in Germany, her family moved to Pennsylvania, Saudi Arabia, New Orleans, and finally Washington State -where Cara graduated from Hanford High School. Hanford is historically famous as the location where the plutonium for the atomic bomb dropped on Nagasaki in World War II was produced. Today, Hanford is the world's largest nuclear clean up operation. Growing up near Hanford Nuclear Reservation had a profound effect on Cara's interest in environmental issues. Cara attended University of Washington and received her B.Sc. in Biochemistry in 1999. She then went on to complete an M.Sc. in Environmental Health Sciences and a Doctorate in Environmental Science and Engineering at the University of California, Los Angeles (UCLA). Cara has lived in Ireland since 2003, when she moved her to pursue research on a Fulbright Scholarship at Teagasc in Co. Wexford and continued work there until 2007 as a Walsh Fellow. She then went on to do post-doctoral research in Trinity College Dublin's School of Business and University College Dublin's School of Agriculture before branching out into environmental advocacy and research management. Cara's surname, Augustenborg, is of Danish origin -which she inherited from her father's family who immigrated to the United States from Denmark and Norway.